Potential customers are searching the web for businesses just like yours. With our Google Now program, your business will be more visible on the world’s leading search engine. This is how you connect with customers you don’t know yet. This style of service is available exclusively only through our company. Get Found Online Now: Whenever the top searches are performed on Google, users will be able to find your website in prominent locations. Risk-Free Placement: Wikreate makes every reasonable effort to ensure your ads can be found on the front page whenever your keywords are typed in. However, no Adwords Third Party can guarantee a specific ad position. Proper Keyword Selection: We highly trained in ensuring your business is featured on the most in-demand keywords for your target market. 7-Day Money Back Guarantee: If your ad cannot be found on the front page in the first seven (7) business days of account creation, we offer a full refund no questions asked. No Long-Term Commitments: With our month-to-month SEM Service, in the rare instance you’re not seeing desired results; you can terminate your account so long as it is seven (7) business days before your account reoccurs. 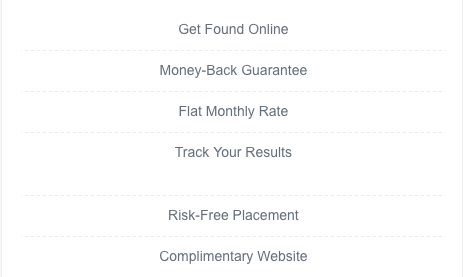 Flat Monthly Rates: The days of endless managing of your Pay-Per-Click (PPC) AdWords campaign are over. With flat monthly rates, you’ll know that the next month will cost exactly the same as the last. Campaign Traffic Reports: At your request a monthly traffic report can be generated for you. Then call us and we can go over it with you. Keyword Exclusivity: (This is Huge) When you purchase Google SEM keywords through WiKreate, the use of the Google SEM keyword combinations are unique for every client. This means if we place one company on a keyword combination we will not place another company on the same keyword combination in your area! Want to Learn more about Google Now SEM? Check out our FAQ Page! **Complimentary micro-sites are optional and do not apply to e-Commerce websites.